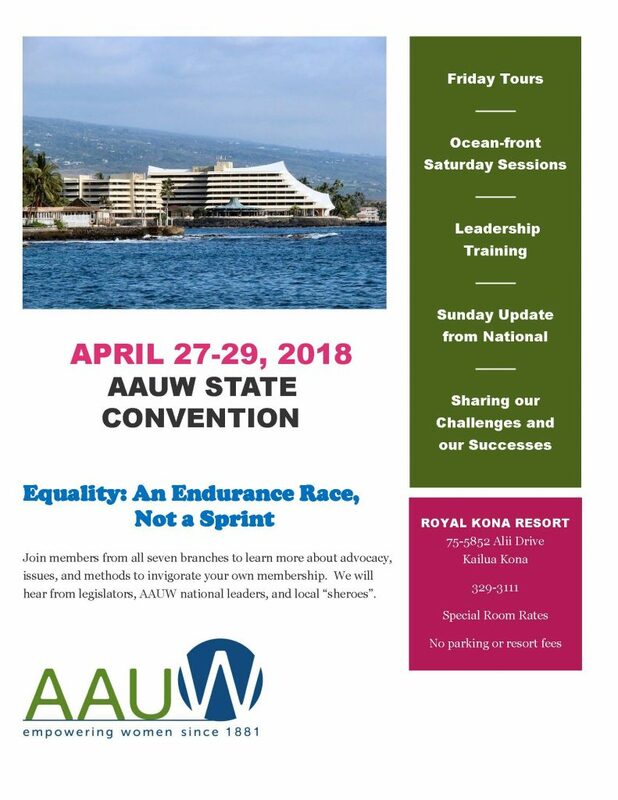 Welcome to the website of AAUW-Hawaii. We are a state-wide organization made up of seven branches: Kauai, Maui, Kona, Hilo, Honolulu, Windward Oahu, and Diamond Head/Koko Head. Our membership is approximately 400. Though we are located on different islands, we endeavor to stay connected. Our board meetings take place through conference calls or on-line, and we have a state-wide convention every other year. Having followed the lead of national, we adopted the One Member, One Vote form of governance in 2012, eliminating the need for delegates. All members are encouraged to attend annual meetings and conventions to share with and learn from attendees from other branches. We endeavor to send a young woman each year to NCCWSL in Maryland. This involves fund-raising and participation of all branches. Our most ambitious state-wide activity is to have a voice in public policy. Three areas concerning women in our state have been identified for focus: violence against women, reproductive rights, and the results of our AAUW research, Access to Success. Our state Public Policy Chair, Dr. Susan Wurtzburg, keeps all members informed about legislation pertaining to these topics. Our branches located on Oahu, home of the capital (Honolulu), are particularly involved in the public policy area; however, advocacy alerts are sent out to encourage all members to write or call their representatives about these issues prior to discussions or votes. We strive to have a voice in the state of Hawaii that reflects the mission of AAUW.